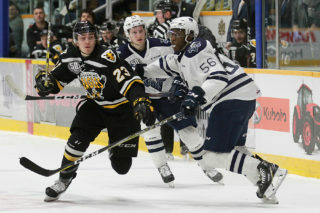 The Screaming Eagles comeback attempt fell short in a 5-3 loss in Saint John on Tuesday night. It was the Sea Dogs power play that got the scoring started, as Maxim Cajkovic tipped a diagonal feed from Robbie Burt at the side of the net to give the home side a 1-0 edge. Before period’s end, the lead would double when Anthony Boucher tipped a William Villeneuve shot from the blueline. At the end of the period, the Eagles would earn their first power play of the night as Tyler Higgins was sent off for tripping. However the Sea Dogs would kill the penalty and the play would go the other way, and Yohan Plamondon would rip a shot over the shoulder of Kevin Mandolese to to make it a 3-0 game. That would spell the end of the night for Mandolese, and William Grimard would come in in relief. The game would remain 3-0 past the halfway mark of the second period as Ryan Francis hit a crossbar, and Grimard would deny Josh Lawrence on a breakaway on the other end. Mitchell Balmas would then get the Eagles on the board with a power play marker at 13:01, ripping a one timer from the top of the left faceoff circle. After another hit post by the Eagles (Alex Drover ringing it off the crossbar), Anthony Boucher would add to the home side lead, coming up the left wing and putting it by Grimard along the ice. Before period’s end though the Eagles would get it back as Brooklyn Kalmikov scored from the right circle with 20 seconds to play in the second stanza, and the period finished with a 4-2 scoreline. 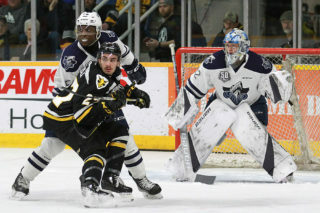 Early in the third period, Francis would hit another post but then hit the scoresheet when he pushed his way through to the front of the net and put the puck under Alex D’Orio. With just over seven minutes to play, the Eagles would hear the ping again as Wilson Forest hit the crossbar in an attempt to tie the game. In the final three minutes Screaming Eagles coach Marc-André Dumont would lift Grimard for an extra attacker. The Eagles generated substantial pressure, forcing Alex D’Orio to turn his body around and make a big save. 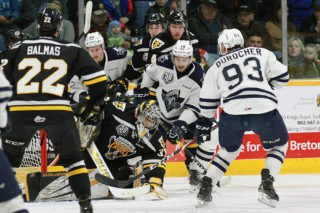 However Cape Breton’s comeback hopes took a hit on the same sequence when Egor Sokolov would be sent off for goaltender interference. After the Eagles gained the Saint John end, Grimard would return to the bench for an “extra” attacker and create a 5 on 5 situation. However Saint John would take advantage of the open goal, as Yohan Plamondon would ting the empty twine to secure the win for the home club. D’Orio picked the win in goal, stopping 36 of 39 shots. Mandolese allowed three goals on ten shots, while Grimard stopped 16 in 17 in relief in addition to the empty netter. 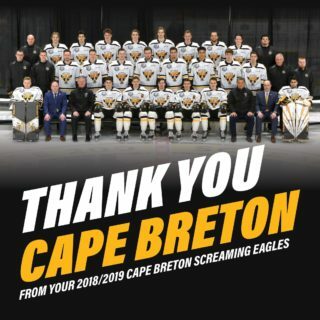 The Screaming Eagles now make their first visit to the province of Quebec, beginning with Thursday night’s game against the Québec Remparts. Puck drop is at 8 PM, and you can catch all the action beginning with the pre-game show with Patrick McNeil at 7:30 on 1270 AM CJCB or online at www.cjcbradio.com.